The historic roots of the “Compagnia del’Astronauta” can be found in the companies of Commedia dell’Arte, the jesters and in small circus travelling freely, performing at markets, fairs and townsquares from passed centuries up to a time not so long ago. 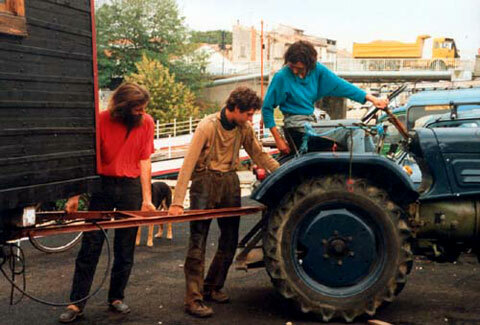 The particular story of “Compagnia del’ Astronauta” starts in Germany in the year 1988, with a first voyage in a circustrailer, pulled by a tractor (20 km/h). Being on the road was the main aim of the trip: leaving its own place in order to discover other, travelling with its own home, meeting and getting to know people, performing as an exchange. Bringing news and notions from another world, where have been created forms of expression like acrobatics, juggling and equilibristic. Performance and music in that way take part of the life of the travellers as means of vital expression as well as to gain their living. After the first trip follows the second, which leads the company to France and Italy, and which , in some ways still is continuing. In the year 1990 starts the collaboration with “Circo Bidone”, small circus with French origins. Similar in spirits, also “Circo Bidone” was following the concept to present the show outside official circuits, performing in villages and small towns. After the circus “L’Astronauta” again is travelling as busker mostly in Middle and South of Italy.